Other than our mobile phones, we use a lot of devices for gaming, work-related activities, social networking sites updates and others. One of that is so popular android device called a tablet computer, or simply TABLET, a kind of mobile computer, usually having a touchscreen, with finger, pen or stylus gestures acting as the primary means of control. Recently, Cherry Mobile released the Cherry Mobile Fusion Bolt packed of a quad-core Actions Semiconductor ATM7025 processor and run on a Android 4.1.1 Jelly Bean. It comes with 8GB internal storage that can expanded up to 32GB via microSD card. It has also 2-megapixel main camera and VGA front camera. 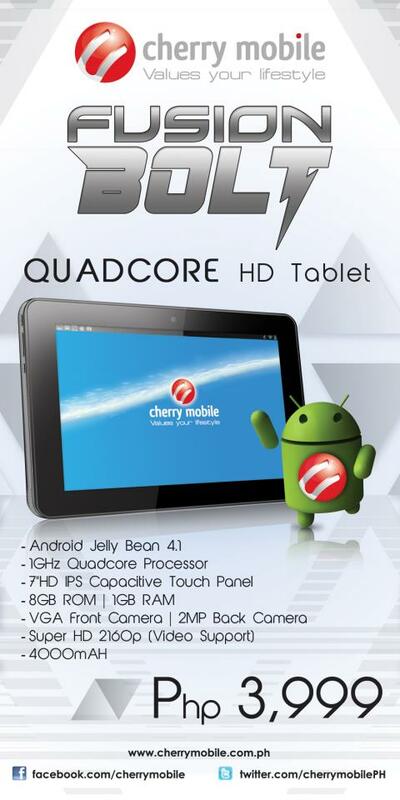 The first time it was released in Cherry Mobile store in SM North EDSA, a lot of people lined up for this tablet. Just imagine guys, for the price of P3,999 you can get a quad-core device. Most of the quad core processor can be found on a laptop and personal computer. 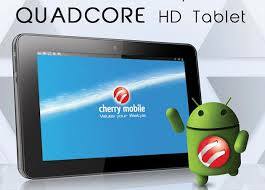 Why we need to buy Samsung tablet or Ipad if we can get the same specs and features or even more on Cherry Mobile Fusion Bolt. But of course each device have its own unique features. Also, it really depends to the users on what tablet they are comfortable to use. Actually I'm getting a lot of good reviews and feedback on Cherry Mobile Fusion Bolt. Try it for yourself.